The creeping selections of Stonecrop are excellent groundcover plants, particularly for hot, dry sites. This variety forms a low carpet of narrow, scalloped green leaves, spreading to form a dense patch. 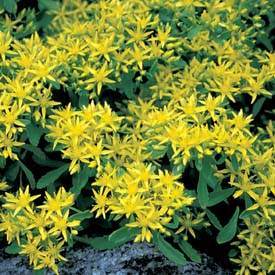 Clusters of golden-yellow star flowers appear in summer. Evergreen in habit, with good red to orange color in fall and winter. Trim or mow back in spring to maintain a compact form. Easily divided in spring or fall if desired.